Although we’ve already weathered a scattered light frost in our part of southeastern Pennsylvania, there are still plenty of blooms to be found. 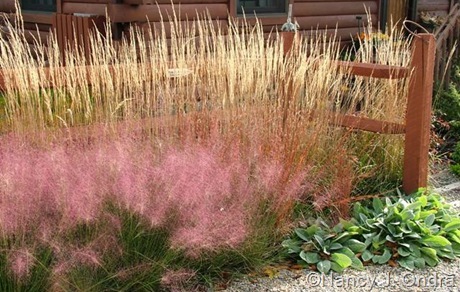 Above is one of my fall favorites: pink muhly grass (Muhlenbergia capillaris). It’s not particularly noticeable for most of the growing season, but from early October to mid-November, those pink clouds are a delight. 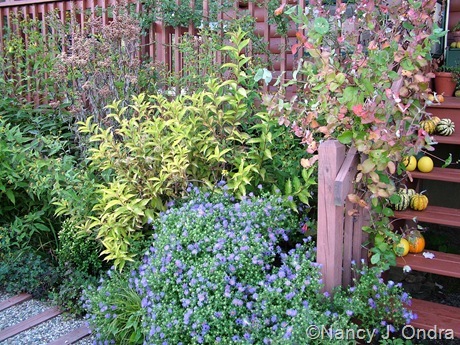 Aromatic aster (Symphyotrichum oblongifolium) is definitely on my top-10-favorite-perennials list. I started out with both ‘October Skies’ and ‘Raydon’s Favorite’, but they’ve seeded around over the past few years, so I can’t tell them apart now. The seedlings are all pretty much 24 to 30 inches tall and about as wide, and they all form tight, leafy mounds that look like they’ve been sheared repeatedly, but without any fussing from me. The color of the seedling is quite uniform, too; the only thing that varies is the bloom time. Some started in August and are quite done by now, while others are in their full glory. 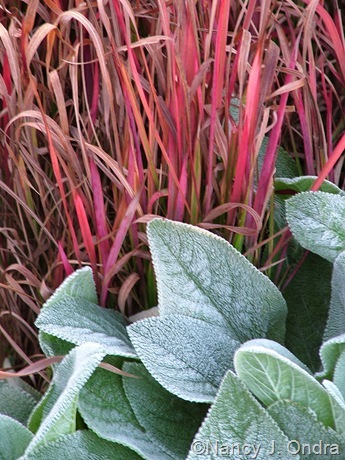 Above, a self-sown seedling hugs the base of golden-leaved Briant Rubidor weigela (Weigela ‘Olympiade’). Above, ‘Immortality’ bearded iris in a glorious second round of flowering. 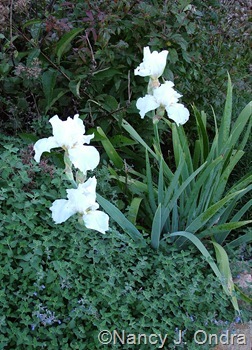 I’m not a big fan of either white flowers or bearded irises, but I wouldn’t be without this one. ‘Golden Delicious’ pineapple sage (Salvia elegans) finally came into bloom a few days ago. And below, blood grass (Imperata cylindrica ‘Rubra’) with . 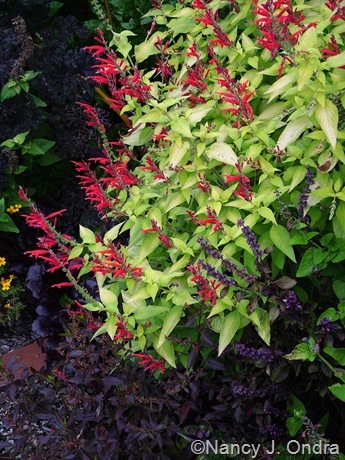 To be fair, this one doesn’t technically have any fresh blooms – but with color like this, foliage can be just as good! To see more October color in gardens around the world, visit the main October Bloom Day post at May Dreams Gardens.